Have you noticed that sewing tape has one wavy edge slightly longer than the other? You can use this to your advantage when taping a waistline. Rather than sewing down the middle of the tape, sew along the shorter straight edge, leaving the longer wavy edge free. If you position the tape so the wavy edge will hang down in the finished garment, it will contour naturally to the figure – try it and see! Forget using straight strips of sleeve head wadding – cut it to the shape of your sleeve head and it will be perfect every time! For evenly distributed gathers, sew with them uppermost, secure the start and end points, then use the tip of a pin to fine-tune and adjust the gathers evenly between the two draw threads. Aren’t I doing well sticking to my monthly schedule – three days still to go in November! What’s your favourite tip out of this bunch? Marking right and wrong sides – I just had to do this with my Frocktails dress, but I used bits of washi tape as I was worried my chalk would rub off! Must check out the facing tutorial. Thanks Sheryll! I always kick myself when I forget to mark the wrong side, it takes only a second and saves any confusion at sewing time. Washi tape sounds like a nice way to do it! Thanks for sharing! My favorite is about the sleeve head – genius! Another simple one! I’ve never looked back since learning that one! I’ve used the sleeve head trick since I saw it on your blog and it works perfectly, I also live your facing tutorial – It gives a beautiful finish. So pleased to hear you are getting great results Chris! Sometimes it is just the little things that make a big difference. 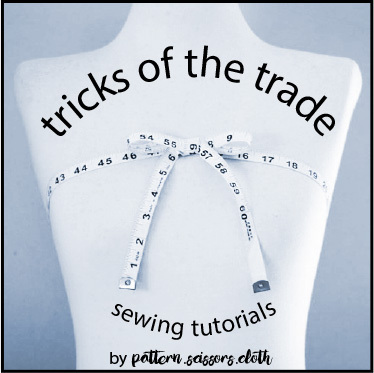 Commercial sewing patterns usually put the zip in last, but I usually do it first because not only is it easier but it fits better with my other construction methods – like all-in-one facings! Love the sleeve head trick – must try it soon. Love your site soooo much. Glad you love it Anne! Do try the sleeve head trick – it’s so easy! There are more details in the RTW Tailoring Sewalong posts if you need it. Never new that about the sewing tape, will have to have a better look next time I use it for my waistband. I think twill tape is flat, but the tape I have (cheap, generic, poly or poly/cotton) is curved to a similar extent as a contour waistband. One day I trialed sewing it in the opposite way and my waistband sat really poorly! I love the all in one facing tip, so neat! They are beautiful when they are sewn right! Late to the party, but the all in one facing is a neat trick. Will try your method next time. thanks!